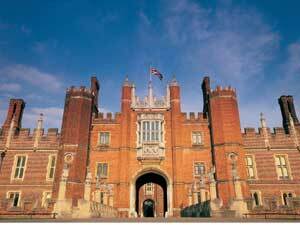 The first tennis court at Hampton Court was built for Cardinal Wolsey, between 1526 and 1529. As a young man, Henry VIII was a keen and talented tennis player who spent hours on court. His second wife Anne Boleyn was gambling on a game of tennis when she was arrested to be taken to the Tower of London. She even complained that she couldn’t collect her winnings! Real tennis is the original indoor racquet sport from which the modern game of tennis is descended. It only acquired its ‘real’ tag at the end of the 19th century to distinguish it from the new-fangled ’lawn’ tennis. The tennis court has displays along the visitor route viewing gallery. These include interactive handmade balls, life size character illustrations and custom made racquets. The Hampton Court Palace tennis club is for private members. Non-members and visitors are only allowed into the viewing gallery to watch a game during the summer months (April to October). Its members only during the winter. They may also close the club at short notice for private events and maintenance. However, it is a very active club, with a lot of members, so your chances of seeing a game in play when the viewing gallery is open are very high. Would you like to try your hand at real tennis? The club offers an introduction to the game, and if you like it you can apply to be a member.